Yorktown presented the interesting problem of calling for classic graffiti to be created (and at one point, destroyed) on stage for each performance. Our solution was to engage a local graffiti artist and photograph his process, capturing an image once every few minutes. These images were then composited in sequence into animations that were projected onto a large set piece that served as the virtual painting surface. The actor playing the artist was then choreographed to abstractly "paint" as the work took form. The effect was quite stunning and evocative. Several other animated montages punctuated pivotal moments within the story. My assistant, BFA candidate Lisa Fadden, was invaluable to the project and responsible for all of the photography (most done in a freezing warehouse in the dead of winter) and many of the composite animations the resulted. The production was vetted for the 2016 American College Kennedy Center Theatre Festival and we await the results. Shorewood High School, known for pushing boundaries in their arts programs (and featuring my daughter as an active arts based student), became one of of the first two high schools in the U.S. (and the only one to produce the piece as written, without modification) to tackle this evocative and charged musical based around the power punk pop of the Green Day album of the same name. As soon as I was aware that Shorewood was considering the play, I knew I had to be involved. I offered my services as a rock guitarist and had the time of my life channeling my inner Billy Joe Armstrong onstage with a group of exceptional musicians culled from the talented student body - but along the way I found myself getting deeper into the technical production itself and eventually, with the help of Lisa Fadden (a visionary UWM BFA candidate) realized the video projection elements. They ranged from literal to completely abstract and were projected over the entirety of the massive three story scaffold based set, becoming as much lighting texture as animation and video. The show received 19 Tommy Nominations and swept the awards, including "Outstanding Musical" of 2016. A couple of intrepid teenagers stumble upon Alba, a displaced music teacher making ends meet as a custodian in their school. But Alba has a secret. He's been hoarding the school's trash in his janitor's closet and using it to create instruments. Over the course of the play we learn the reasons behind Alba's need to re-use and re-imagine materials in order to create music. This musical combines music performed live on trash-inspired instruments with virtual environments. The same configuration and system used in The Congo Code (below) was retooled for this commissioned work to present over 100 video sequences during the 40 minute production. A side note; I also created the custom "trash instruments" used in the show including a Plosive Aerophone (those PVC tube drums made famous by The Blue Man Group) and an electric guitar that incorporated a dust buster dubbed "The Les Dustbuster". Fox 6's Real Milwaukee did live broadcast segments. I was interviewed regarding the technology used. A young man is transported into to a video game virtual reality and must embrace empathy for the wildlife wildlife and embrace conservation to survive. He is aided by the virtual character of the Quartermaster, who sends him coded messages with critical clues, Dr. Info, another virtual character who provides knowledge about his surroundings and his friend Tayor, who hacks into the game from the real world. I designed the set, created all the multimedia content and media delivery system. A 7'x10' rear projection screen on which all video content was displayed dominated the 18'x20' playing area. Over 100 fully scored video sequences, 2 live camera feeds and all audio was handled by an iMac running QLab and triggered by the actors themselves. We did it for under $8000 and the whole show fits in a panel van - including the actors (who, by the way also load-in and strike the piece for every performance in under an hour). 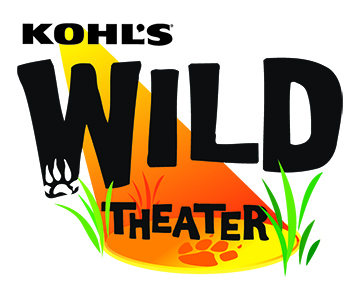 In September 2014, KWT premiered the show at the International Museum Theatre Alliance's annual convention in Chicago as part of a key presentation from the director and myself on limited budget technology usage solutions in storytelling for museum theatre. 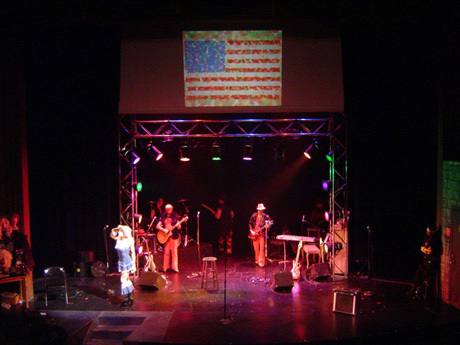 This production was an re-envisioning of the show as produced by Milwaukee Chamber Theatre over a decade prior. As imaging and projection technology had become considerably more sophisticated in that time, I was called in to create new content for the show. Conceptually the performance took place on a bare stage in front of a choral band shell to emulate the environment of a real Marie Callas master class. As Maria would shift into exposition of her past life, images of LaScala opera house in various states would fill the band shell helping transport the viewer. The final transition of the show featured the on-screen construction of a stage set for Macbeth. I used a variety of source images from Belgian castles to "build" the set in a series of dissolving stills. I used two front projectors to fill the bandshell, placing the half of each image on either side and blending them down the middle. Each projector was fed by it's own computer running QLab 3. I synchronized the cues by creating MIDI messages from one QLab session (which also included the sound portion of the show) to the other over ethernet. Even though the specifications of the projectors was exactly the same, there was significant color and brightness discrepancies between the two. I spent a large amount of time color correcting (both offline in Adobe Photoshop and in real time within QLab) to compensate for the differences. The discrepancies also led to asynchronous fade and dissolve times and timing the cues between each was a significant challenge. Doug Vance designed the lighting and Michael Growler designed the costumes for this critically acclaimed production. Hedwig was quite a departure for Milwaukee Chamber Theatre. The show was performed in the Milwaukee Broadway Center's Cabot Theatre, which is an immaculate reproduction of a 19th century opera house, complete with tiered seating, gilded wall treatments and massive crystal chandelier. 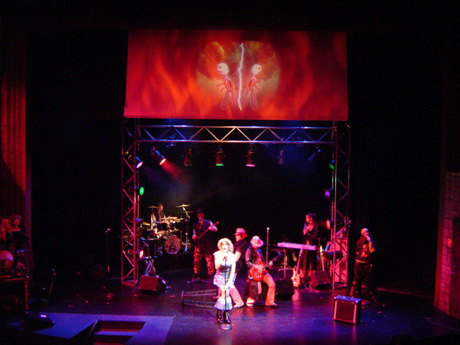 The setting itself was minimal, consisting of a low budget rock and roll lighting truss, dressing room table and a faux stage door unit. The majority of my work was done on the 100+ images projected just above the actors. Some were digital montages, but most were painted (digitally) using Adobe Photoshop.